Learn how to maximize hotel efficiency and profitability by following these top management tips. The U.S. hotel industry is worth $208 billion and growing every year. Running a hotel is a lucrative venture that presents lasting financial potential. But, this industry is unkind to complacent owners, and the only way to stand out among the competition is to provide exceptional guest satisfaction every single day. As a hotel owner, your effort in daily facility operations is crucial — the day-to-day difference will determine which aspiring entrepreneurs are here to stay and who will check out early. You have likely been a guest in countless hotels, but have you ever stopped to think about the specific minutiae of effective housekeeping? When you’re on the other side of maintaining a hotel, you soon realize how much effort goes into hotel-quality cleanliness. Your housekeeping staff provides the invaluable service of making your facility shine, and cleaning up after guests day after day is not possible without the proper equipment. Unlock new efficiencies with industrial-strength vacuums, bulk cleaning solutions, specialized brushes, and more. There are retailers that specifically cater to the needs of hotel owners, so partner with one of these distributors to get the materials you need. Equipping your staff with the right tools of the trade is essential. Of course, the best equipment in the world isn’t worth much unless you employ hardworking, dedicated housekeeping staff. Remember: your facility is only as good as the sum of its parts. Make an effort to scout housekeeping employees who will not only offer exceptional cleaning services but also take pride in their work and elevate your facility sanitary standards. One untidy room, a missing amenity, an unsubtle employee sneer — any number of unintentional blunders can sully a guest’s stay and lead to negative reviews. On average, customers are twice as likely to complain about a bad customer experience than praise a good one. 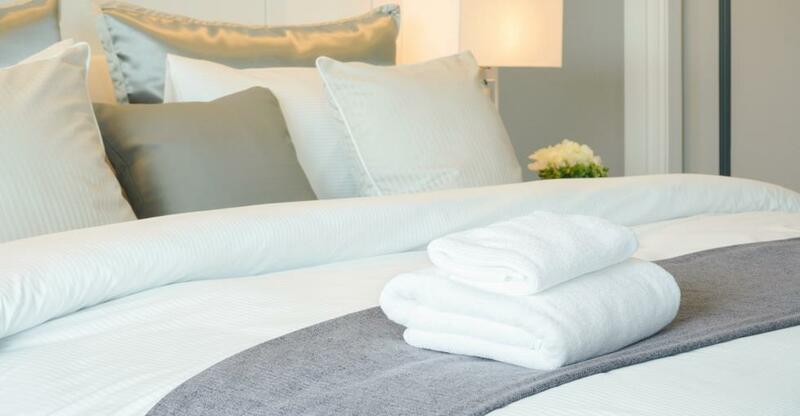 Go the extra mile: Treat guests to the more expensive pillow, offer the high-end shampoo and conditioner amenity bottles, outfit each room with a coffee maker. Even though it might seem insignificant, one small, complimentary chocolate on the pillow can go a long way. Offer excellent customer experience to every single guest, and then ask how you can make their next stay even better. Keep in mind that merely reacting to guest needs is only half the battle. Truly exceptional hotel owners will regularly receive feedback and adapt accordingly. Open your facility up to scrutiny — read online reviews from sites like TripAdvisor, collect satisfaction scores internally, and invite criticism according to specific experience criteria. A sound reputation management strategy is key to promoting ongoing customer satisfaction. We’ve talked about managing guests after they arrive, but how about getting them in the door? Loyalty program : Encourage repeat visits by giving guests perks. Discounts, amenities, food/bar gifts, and more will promote ongoing patronage. If you are already using a point-of-sale (POS) system like Square this will be especially easy to execute, since you can usually establish a loyalty program within the application. Web traffic : Chances are that your guests will find you online. We have already touched on how to boost your online ratings, but consider giving your property website a makeover as well. Content marketing initiatives such as blogging will help drive organic traffic and put your hotel on the digital map. Virtual tour: Guests want to be sure their stay will feel like home. Offer ample photos of your facility interior, and, if you have the means, create an online, interactable tour of rooms so guests can make informed booking decisions. All of the above marketing considerations are already taken care of when you open a hotel with an established brand. If you are new to the industry, you might find it helpful to start by buying a franchise. Running a franchise helps teach you easy, affordable marketing strategies that you can carry over to your next business venture down the line. Franchise fees might soon offset initial benefits, but this is a good place to start. Once your business is running at peak efficiency and profitability, you might consider selling. That’s where Businesses For Sale can help — read our hotel sales guide, and learn more about streamlining the sales process. When you purchase an RV park, you are not only buying a business but supporting a recreational way of life. With a growing economy and increased travel spending, 2019 is the perfect year for getting into the hospitality business. If you’re in the market for a new business venture, consider a mobile home park. But first, read about some of the pros and cons here.